Mika Zibanejad (5-2–7 over 3 GP) led the league in goals scored, three of them consecutive game-winners, for the New York Rangers to head into their bye week with a win streak. Zibanejad, who entered the week with a two-game point streak, led his team in scoring with seven points and a 62.5% shooting percentage, while also leading team forwards in ice time with an average of 20:35 per game. 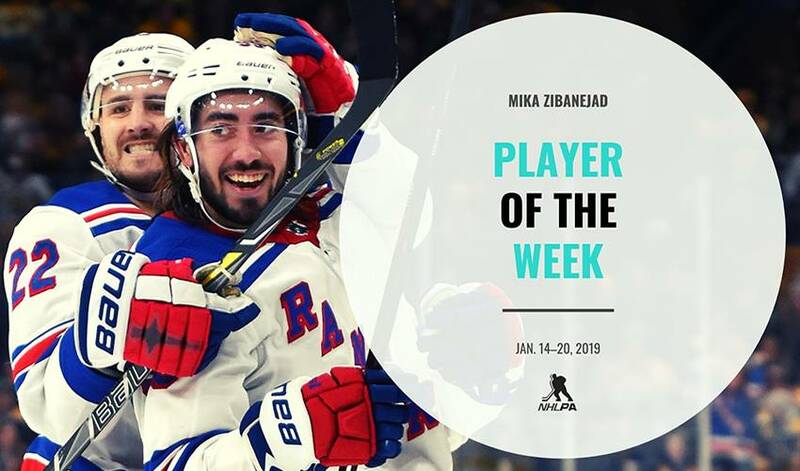 Zibanejad scored his first game-winner of the week as part of him netting back-to-back goals Tuesday night in a 6-2 victory over the visitng Carolina Hurricanes. The outing was Zibanejad's third four-point game of the season. He skated in 18:42 of ice time for a game-high among forwards while earning the game's first star in a victory which marked the Rangers' 16th straight win against the Hurricanes at Madison Square Garden. Rangers netminder Henrik Lundqvist, who appeared in his 838th NHL game to pass Hall of Famer Jacques Plante for 12th place among league goalies in all-time games played, credited the special teams as Zibanejad scored his first goal of the game with the man-advantage and logged 2:06 on the penalty kill. "If you have to point at one thing tonight that really helped, special teams," the goalie noted postgame. " Unbelievable. Power play obviously, but also the penalty kill. I can't tell you how much that helps the team, how much confidence that gives the group when you're able to cash in on their penalties and also make sure you don't give up a goal on the PK." Carrying a three-game point streak into Thursday's matchup against the Chicago Blackhawks, Zibanejad netted another game-winner to push his point streak to four games by scoring an empty-netter scored at 19:42 for a 4-2 lead. He was named the game's third star ending the night with a plus-3 rating while logging 3:02 of ice time with his team short-handed. The win, which marked back-to-back wins for a team after losing six of their prevoius seven games, had the Rangers feeling understandbly celebratory in front of the home crowd. The Rangers took to the road for a matchup against the Boston Bruins Saturday night. In a 3-2 victory, Zibanejad picked up the game's first star with yet another game-winner while Lundqvist picked up another milestone in his 446th career win to surpass Terry Sawchuk for the sixth most wins in NHL history. Zibanejad had impact on special team units again, skating in 3:53 of ice time over five power-play opportunities for the Bruins, and scored the go-ahead goal with the man-advantage in the final frame. It was the Swedish forward's fifth goal in three games and his 17th of the season (17-27–44). Zibanead also became the second player in Rangers history to score the game-winning goal in three straight games, after Rod Gilbert first did so in 1966. "You want to go into the break with a good feeling especially when you're sitting with this game for nine days," Zibanejad told reporters postgame.